Professor Averil Macdonald is the chairwoman of UK Onshore Oil and Gas, and emeritus professor of science engagement at the University of Reading. She’s just hit the headlines because she’s attributed the fact that more women than men oppose fracking to their lack of scientific understanding. Apparently only 31% of women think tracking should be allowed, compared with 58% of men. According to Prof Macdonald, that’s because they don’t understand the science. 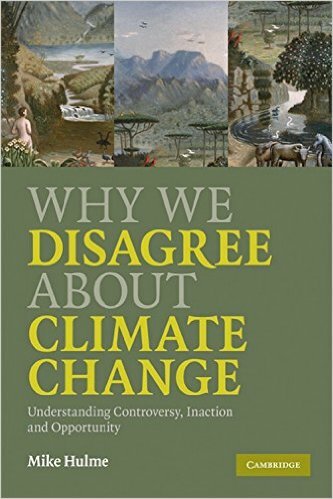 By coincidence I’ve been reading Mike Hulme’s brilliant book Why we Disagree about Climate Change. What Hulme shows is that our understanding of these issues – climate change generally, or tracking – is conditioned by a whole swathe of factors: how the issue is framed; what the perceived risks are, what our value systems are, and so on. He shows how many interpretations there are even of the word ‘climate’, and how these have changed over time. Did you know that John Tyndall got onto greenhouse gases in 1859, and in 1896 Svante Arrhenius calculated (by hand) changes in the concentration of carbon dioxide in the global atmosphere? But of course they could only get a partial handle on these issues and their impact on the climate. ‘Fracking’ can probably be defined more clearly and certainly than climate. But the key message from Hulme’s book is that the idea of a rational linear process, from factual understanding to agreed conclusions, is often unrealistic – even amongst objectively well qualified participants. That’s a sobering thought for all of us who like to put our faith in scientific processes (and talking of faith, it’s interesting that Hulme wears his Christian faith on his sleeve). So the idea that if women arrived at a higher level of factual knowledge about tracking they’d all troop into the yes lobby just doesn’t stack up. Values, judgements on the seriousness of perceived risks and, yes, emotions, will continue to play a big part. Macdonald does express disappointment that there are so few women in the industry, and she is acting valuably as a model for others to follow her into the sciences. Public engagement in science is a really valuable field. But I think her real contribution to the PP debate may be to make us think more about why some positions are accepted and others aren’t – not only on specific ‘scientific’ issues, but on a whole range of judgements, including in the workplace. Of course good factual knowledge is essential – or at least, as good an informational base as you can get – but ‘facts’ are not always what they seem. Maybe we need a Mrs Gradgrind to give us an alternative view.